Prada crossbody bag in metallic saffiano leather. 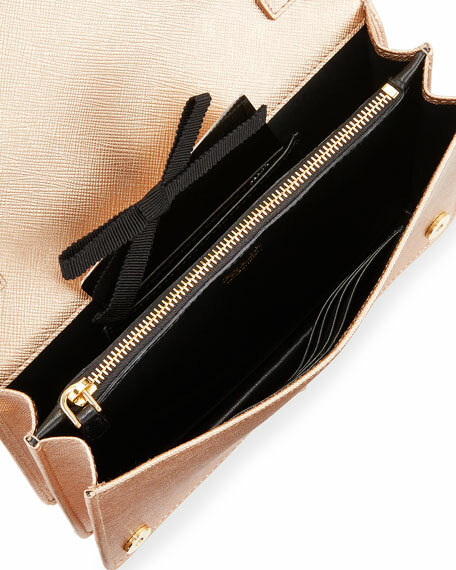 Inside, center zip compartment; card slots; bill pocket. 5.3"H x 7.9"W x 1.6"D.
Prada trunk bag in metallic/saffiano leather. Flat crossbody strap, 19.8" drop. Flap top with reinforced corners. Center tab with metal logo lettering. Inside, slip compartments. Approx. 4.5"H x 7"W x 1.8"D. Made in Italy. Prada crossbody bag in pebbled calf leather. Removable/adjustable web and leather crossbody strap with protective pad. Double zip top closures lead to dual compartments. Interior, logo-jacquard lining; one slip pocket. 6.9"H x 9.5"W. Imported.